Tattoo-related traditions in the South-West Asia are one of the oldest in the world, going back all the way to the third millennium BC. In Thailand, the memory of the sacred lines of ancestors has not been lost and is still passed from one generation to another. Sak Yan (sak means to tap and yan, yant, yantra is Thai for sacred symbol) is a part of Thai religion, rooted in the oldest animistic beliefs as well as Brahmanism and Buddhism. Masters of tattooing (Ajarns) took it upon themselves to assure that these sacred traditions are continued. In the privacy of their personal sanctuaries, called Samnak or Samnak Sak, they embellish the bodies of their apprentices (Luksit) and devoted believers with magical designs (yantrami or yan), with the use of large, needle-like tattoo devices. Sak Yan surpasses our contemporary perception of the phenomenon tattooing is. For the believers, it is an answer to their life problems which they come to the master with. Mystical animals and deities that appear on the surface of their skin, energised by a mantra or a holy spell (Katha), serve as talismans which shall bring their bearers strength, courage, love or protection against wounds. These powerful symbols are the medium for omnipotent magic (sayasart), which penetrates the human body, altering one's life. However, every apprentice has to follow the rules outlined by his master and abide by his laws. Should they not obey, the tattoo loses its power and becomes nothing more than a permanent drawing on their skin merely. The exhibition showcased at The Asia and Pacific Museum showcases photographs by Matthieu Duquenois, who has been researching this field since 2006, both as a theoretician and in practice. He has been tattooed by more than twenty-five Sak Yan masters. He is the second European ever honoured with the possibility to become Ajran – Master of Thai tattoo art. He was blessed by Phra Ajran Mann and the late Ajran Thong, for whom the exhibition is dedicated. Thanks to amazing photographs by Ajran Matthieu, we will discover the spiritual world of beliefs and rites, and the sacred iconography of Sak Yan. There will also be tattoo devices showcased, held within the collection owned by the museum. Ajarn Matt and his wife, Ajarn Rung, will be guests of The Asia and Pacific Museum and Warsaw Tattoo Convention. 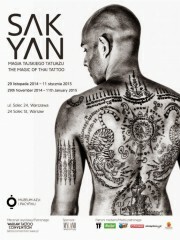 During the convention, 29th - 30th November, they will present the traditional Thai tattoo technique.